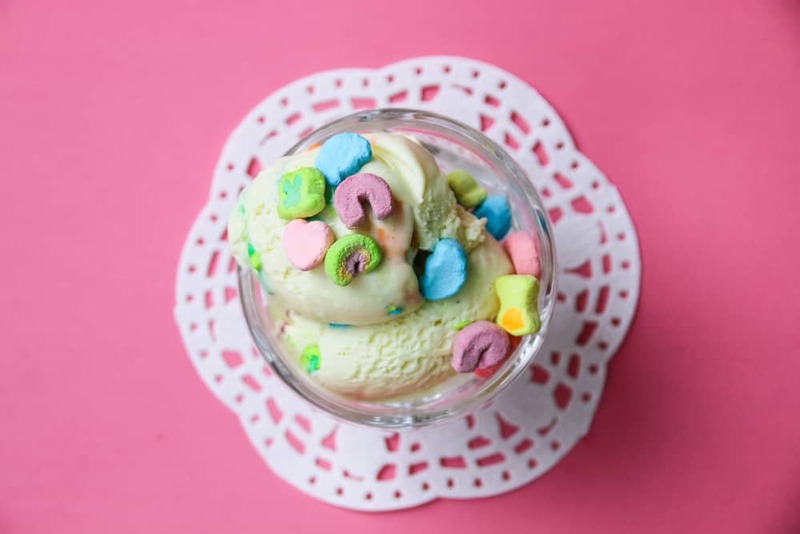 Scarlet and I have been making ice cream, which is rather complicated when you use a custard base and an 8-year-old helper, but also acts a science project with a – in this case – magically delicious result. We’ve done the standards (vanilla, mint) and have been coming up with interesting flavors to try. 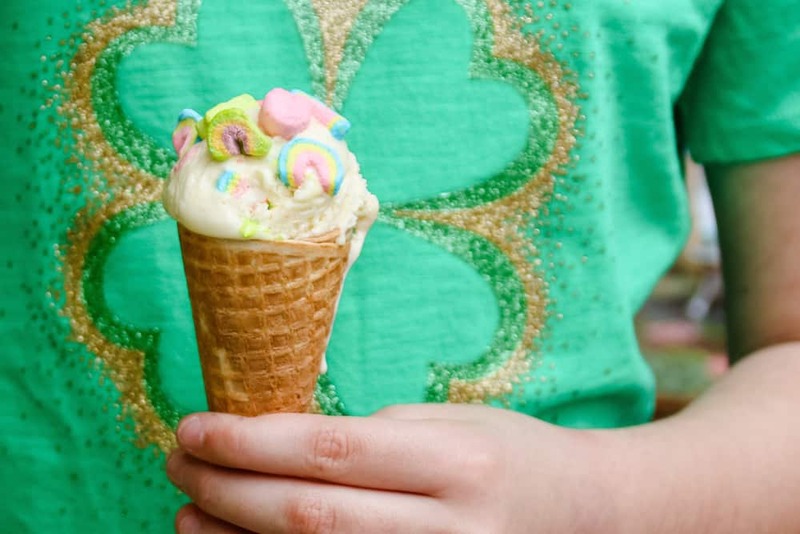 So when she suggested we make Lucky Charms ice cream for St. Patrick’s Day, I was like DEFINITELY. This recipe makes about a quart of ice cream. It’s based on the America’s Test Kitchen standard ice cream recipe with a few key changes. 1. Combine the milk, cream, and lucky charms (not the marshmallows) in a bowl. Cover it and put in in the refrigerator for several hours. You’re trying to achieve the flavor of the milk that is left in your cereal bowl after you gobble your sweet treat. After several hours, remove and strain the cereal out so you just have the milk and cream mixture. 2. Set a mesh strainer over a bowl, then set that bowl over a larger bowl filled with ice water. 3. In a small bowl whisk together the egg yolks and 1/4 cup of the sugar. 3. Add the remaining half a cup of the sugar to the cream-milk mixture and set in on a pot on the stove over medium-high heat. Stir until the sugar dissolves. When you see steam (but not simmering), and the mixture has reached about 175 degrees, about 5 minutes, use a ladle to scoop out about 1 cup of the liquid, then add it to the yolks. Whisk to temper (this prevents your eggs from scrambling). 4. Take the yolks and add them back into the pot with the rest of the milk-cream mixture. Continue to cook until it’s super hot but not simmering (about 185 degrees). 5. Strain the custard into the bowl with the mesh strainer over the ice water. Stir occasionally over the course of about ten minutes to cool. Cover the bowl with plastic wrap and put it in the refrigerator until it has cooled completely, about 3 hours, but you can leave it in there up to 24 hours if necessary. Do not skip this step – if you churn it now it will not set up correctly. 6. Once the mixture is cool, set up your ice cream maker. Add 1 teaspoon of vanilla and stir the mixture, then pour it into the ice cream maker and churn according to the instructions (it’s usually about 20 minutes give or take until it’s a nice soft-serve consistency). In the last minute of churning, add the marshmallows to distribute. 7. Pour the ice cream into an airtight container, and place in the freezer overnight, or at least 4 hours. 8. Get lucky! Eat a big scoop! This looks magically delicious. Lucky Charms milk is my fav. Genius! Ship some to my house now please. My stepdaughter and I just made this recipe yesterday for my husband’s birthday. We actually made it into an ice cream cake paired with a layer of funfetti cake. The birthday boy was very very happy! 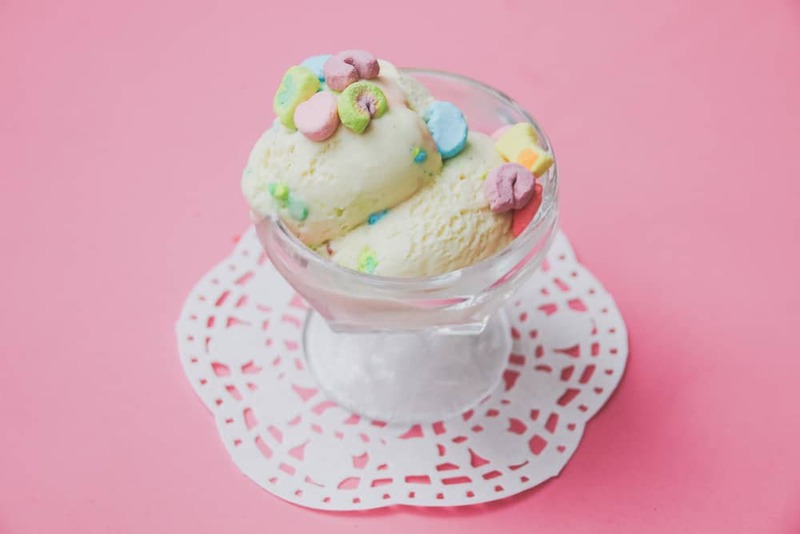 The ice cream tastes exactly like lucky charms in a bowl of milk. Yum!! That sounds amazing!!!! So glad he enjoyed it.